Pink metallic heart decorated fashion sandals for a girl. Pink leather decorated with heart print. Good for regural to narrow feet. 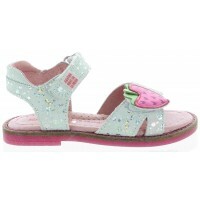 High arches sandal for child. Adjusts great since it has double velcro so ok for narrower and wide foot. Design is great as well. 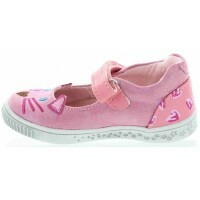 Pink Prada baby shoes with archesLeather kitty shoes for a girl, fun and cute to wear in a Summer. Leather mary janes shoes for a toddlers from Spain Made out of pink/pink metallic leather and decorated with a cat. Arches present. Will not sweat .. Wide foot girls sandals with high archesQuality sandals for girls with good arch for walking Made in Italy by Geox. Made out of fuschia patent, gold and colorful leopard print leather. Profiled soles and will not sweat in those sandals. Best for runn..
Best shoes for eight months oldStart up walker pink sandals for a toddler. Made by Italian brand Geox. Made out of pink/metallic pink leather. Decorated with hearts all over the style. Arches present in the sole of the model. 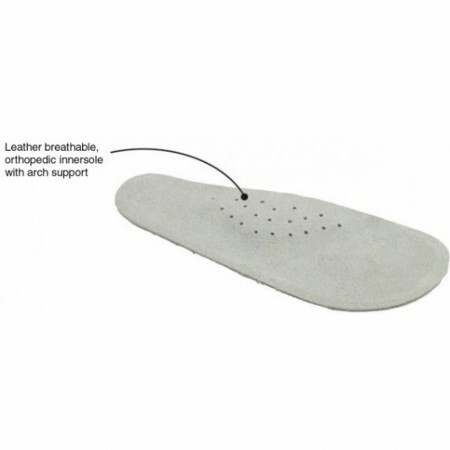 Ortho sandals for baby wi..